You may well ask why is a business known for menopausal clothing aimed at alleviating menopausal night sweats and hot flushes producing a male t-shirt. As with many innovations you set off solving one problem and end up solving a similar problem for many others. Since we started Esteem – No Pause we have had requests from men saying that “when are you going to make something for us, we get sweaty too”. In the main these requests came from cancer patients, and people living in humid climates – Southern Sweaty States of America in particular. 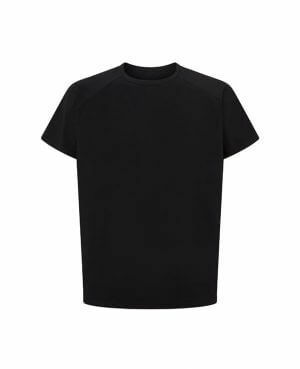 The development and sampling of the male t-shirt was done in collaboration with a drummer and yoga enthusiast who until wearing his Esteem – Man T-shirt found himself and his clothing to be much too damp for comfort! Below is a very comprehensive and detailed testimonial from Nick who is currently living and working in Dubai. He has put the packaging and the male t-shirt though their paces. I hope that you enjoy reading Nick’s testimonial below. First things first, the packaging feels clean and sleek, the pack opens easily and the tee slides out without fuss – I’m an engineer by profession and I can tell that there’s some considerable thought gone into the packaging materials (even down to the adhesive; the flap separates without fuss, but the gum is strong enough to keep the pack together). Most people won’t articulate this, I expect, but they’ll have the same engagement even it’s subconsciously. A good start. Unfolding the shirt, the material feels smooth and light to the touch. The colour is a brilliant white and the material has the feel that it won’t fade or discolour. Once again, I’m caught by the detail; the card label is crisp and substantial, with subdued advertising, the safety pin is an elegant design and the printed tissue separator is a nice touch . The shirt itself has a cool texture and the inside is subtly different from the outside, the seams are neat and even, without snags. Putting on the shirt, you feel immediately how cool it is. I’m a standard build and the shirt is a great fit – comfortable across the shoulders and not flapping around the waist. I like the style – the round-neck fits and looks good (it’s snug without gaping or chafing) and the sleeves are the right length. Outdoors, I’m feeling the cooling effects of the material straight away; where the shirt touches the skin around the shoulders and arms, I can feel the cooling action. The material has ‘give’ and is not restrictive – great for when you’re being active. My tee has a modern, stylish vibe, too – it’s my new ‘go to’ item of clothing when I’m going to be active or want to look casual-smart. It’s easily smart enough to wear out socialising and when the occasion is right I’ll wear mine under a tailored jacket. I’m visiting Egypt in December and India in March, so I’m looking forward to putting my tee through its paces there.